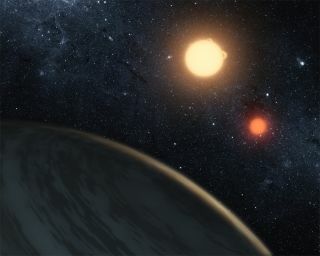 In a scientific discovery that seems ripped from the pages of science fiction, astronomers have found a planet that orbits two suns, just like Tatooine in the movie "Star Wars." The Tatooine-like planet is called Kepler-16b and was discovered with NASA's Kepler space telescope. It is called a circumbinary planet, meaning it circles a binary star system. SPACE.com spoke to study leader Laurance Doyle, an astrophysicist at the Search for Extraterrestrial Intelligence (SETI) Institute in Mountain View, Calif., about the bizarre alien world and what it means for our search for life in the universe. Could there be more planets like this out there in the universe? About half the stars reside in double systems in our galaxy and about one in 70 are eclipsing binaries. We discovered that with Kepler. Now that we know how to find circumbinary planets, I think in the next month or so we're going to find a few more. We know what they look like and we know the tricks they play. Are binary star systems any less likely to have planets than single stars? Apparently not. There are disks that people think precede the formation of planets. And they found just as many disks around double stars as they had around singles. This is really encouraging. But some people argued the two stars would dissipate the disk before planets could form. Other people said, no, when you mix up the disk it actually starts to coagulate, you might say, or accrete, and you get planets forming even faster. The community was split on this. But now we know that planets do form, so that kind of dispenses with a whole line of models. Could life ever exist on a planet with two suns? The way astronomers look at it is they say, 'What happened here, we assume, is not unusual.' I don't see any show stoppers. Nothing I've studied here is a process that wouldn’t have happened elsewhere. I see no reason why you can't find a habitable system around two stars. This system is stable so I don’t see why others couldn’t be. But speculating on what their biological cycles would be as a consequence, that'd be a fascinating study. Would it ever be nighttime on a planet with two suns? It would sometimes be a very short nighttime when the stars are far away from each other, then when they drew close you'd have a longer nighttime. If you lived on this planet, it's like, how do you keep time? These guys are either going to be really good at keeping time or really confused. As far as sunset on Tatooine goes, it would be different just about every time because the two stars are changing in relationship to each other. You'd sometimes see the red star set before the orange one. Sometimes they'd be far apart, sometimes close, sometimes they'd be setting in eclipse. The whole sunset idea that George Lucas had, it's way more dramatic than that. It’s a moving sunset. That’s a sign of nature. Whatever we can imagine, nature has something more dramatic than that. When did you think of the Star Wars connection with your discovery? The point is that science fiction can become science fact. We don’t just have to escape. The real universe is out there and even more amazing than we can imagine. It's good to check with nature and reality I think. How far have we come in our ability to find alien planets recently? I think this is a key time in history for understanding our solar system in the context of other stars in the galaxy. I first started looking for planets around 1993, a couple years before the first ones were ever found. There were just three people working on this. To go from three people to tens of thousands of people, it's great. I've seen this whole field just go nuts. Do you think we'll soon find habitable planets, and maybe even life? I think we're going to find potentially habitable planets with Kepler in the next five years or so. Say we find an Earth-sized planet in the habitable zone of its star, say we find three or four of them. If there's enough public interest, the next mission would be to look in the atmospheres of those planets to see if there's biological processes. Oxygen is really reactive – if you find oxygen floating freely in your atmosphere then something's making it all the time. Free oxygen is a sure sign of photosynthetic processes. If you find oxygen or ozone in the atmosphere of another planet, you've got a forest, you've detected a forest on a planet around another star. If all these things are funded we'll get this in our lifetime.